Who Was Abbie Greenleaf and Why was the library named after her? 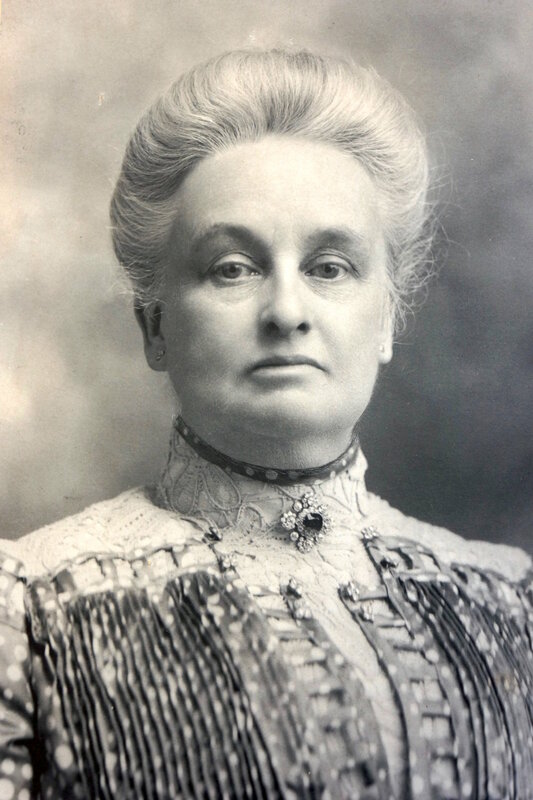 As we began to create the history page for this website we realized that although we had a lot of information about Charles Greenleaf, the man who conceived the idea of creating the library and funded its construction, we had little information about the library’s namesake, Abbie Greenleaf. What we know is that Abbie Frances Burnham Greenleaf was born in Newbury, Vermont in 1841. She was a member of the Boston Daughters of Vermont and the Daughters of the American Revolution. She married Charles Henry Greenleaf in 1867 and was known to have lived in Massachusetts and New Hampshire. She was said to have loved the White Mountains and the people of Franconia. In April, 1914, at the age of 73, she died in Boston, MA. In her obituary which appeared in the Littleton Courier on April 23, 1914 she was described as “a woman of strong individuality [with interest] in numerous charities and in all movements for the public betterment.” Below is a history of the library and its founders based on what we could glean from the archives. We will continue to search for more information about Abbie Greenleaf. If you have any information, please let us know! Contact Us. Franconia’s library collection began in 1850 with a donation of 100 books from two of Franconia’s permanent summer residents and authors, Mrs. Annie Trumbull Slosson and W.C. Prime. A small room in George H. Burt’s general store was secured to house these first 100 volumes. The patrons of Burt’s store became the patrons of the library, with the proprietor serving as librarian. It was called the “Social Library” and was supported by membership fees and fines. In 1892, the library became a “Free Library,” open to all the inhabitants of the town and, at this point, the now 339 books were moved to a location that also served as the post office. By 1910, the collection had grown to 4,336 books and was exceeding its space. In 1913, these original volumes were transferred to the newly completed Abbie Greenleaf Library which had been generously donated to the Town of Franconia in 1912 by Colonel Charles H. Greenleaf. In 1857, Charles Greenleaf began a long and prominent career in the hotel business as a bellboy working for Richard Taft at the Profile House, a hotel complex once situated at the foot of Cannon Mountain in Franconia Notch. At age 24, Greenleaf accepted an interest in this hotel business and oversaw many of the developments at the Profile House, including the construction of a large addition to the hotel and 29 cottages. He witnessed the introduction of gas lamps, post and telegraph offices, private baths, and the construction of gift and barber shops, an enormous parlor, billiard halls, bowling alleys, and a private golf course. When Richard Taft died in 1881, Greenleaf became the sole owner of the Profile House and its many acres of land in Franconia Notch. In 1905, as part of an expansion plan, the hotel was demolished and a larger, more luxurious four-story frame building with 400 rooms was constructed. By 1921, Greenleaf had decided to retire and sold the entire enterprise. And then, in 1923, the hotel and all of the surrounding buildings burned to the ground. After this tragic event, a citizens’ movement came together to ensure that the land of Franconia Notch (Cannon Mountain, The Basin, The Flume, Echo Lake, etc.) would not be handed over to logging interests, and ultimately this led to the creation of Franconia Notch State Park. Charles H. Greenleaf loved the White Mountains and hiked them often. He made his home in Franconia and in addition to his interest in the Profile House and his leadership in preserving The Old Man of the Mountain, he was the treasurer and manager of the Profile and Franconia Notch Railroad. He was a New Hampshire delegate to the 1888 Republican National Convention and an active member of the New England Hotel Association. He gained the rank of colonel when serving as a staff member to Governor Benjamin F. Prescott. In 1912, Greenleaf ordered the construction of the Abbie Greenleaf Library and gave the building and an acre of land to the Town of Franconia in memory of his first wife. Below are photos of The Cascade Bridge in Franconia Notch, The Profile House, a passenger train on the Lafayette Viaduct, Abbie and Charles Greenleaf on Echo Lake and, two photos taken at the Profile Golf Club. After much research and consideration, Charles Greenleaf chose the architect W.H. McLean to design the library. At its completion in 1912, the library consisted of three rooms: a reading room, a stack room and the central vestibule with circulation desk. Colonel Greenleaf was particular about all the details of the building, including the stained glass windows and mahogany woodwork. The centerpiece of this structure, the handcrafted mosaic floor, was copied after the much admired Marble Room of the Massachusetts State House in Boston. Years later, another generous donation was made by a former trustee, Lucy K. Priest, in memory of her parents, Harry W. and May M. Priest. This provided for the 1971 addition, which doubled the size of the building. A large stack room, meeting room, new lavatory, utility room, and side entrance were added. In the 1980s, Chauncy Blair, also a former trustee, established the Jarvis Blair Fund for the advancement of technology at the library. In 1997, the town, with the help of additional individual and business donations, funded a handicap ramp and entrance to the rear of the building. An interior lift and handicap lavatory were added in 1999, making the building handicapped accessible. From the opening of the new library to the present day, Franconia’s citizens have carried out Greenleaf’s wishes to support and maintain the gift that he entrusted to their care. The town continues to vote financial support for the library at their annual Town Meeting. Daisy Woodward, the town’s original librarian, served in that capacity for over 20 years, her last year being the first year in the new building. She was responsible for lighting the candles and snuffing them out at closing time, and probably for providing fires in the fireplaces too, as there was no electricity in the building at that time. Her successor, Eva Aldrich Cummings, was librarian for close to 45 years. Eva Callender served for six years as Mrs. Cummings’ assistant. Succeeding Cummings was Kathryn V. Maybury who served for ten years, followed by Virginia K. Grunhof (2 years), Aurelia C. Hucksoll (10 years), Amy Weadock Bahr (21 years), and Jane Cloran (12 years). This document was created in large part from excerpts of notes recorded by Eva Stebbins Callender and Amy Weadock Bahr.